Spoonfull, originally uploaded by coffeevamps. 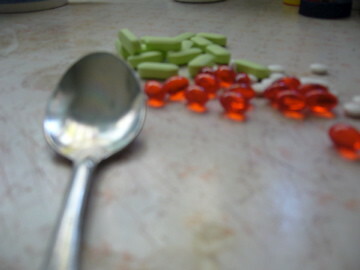 My meds now are a meal in themself. This is what happens when you end up in a car accident, your overpowered by pills. This entry was posted on December 11, 2006 at 5:15 pm and is filed under coffee, Uncategorized. You can follow any responses to this entry through the RSS 2.0 feed. You can leave a response, or trackback from your own site.